belonged to the genus Capronia, in which taxa have been identified as my-corrhizal symbionts of ericaceous plants (Allen et al., 2003). In addition, we recovered DNA from a group of recently discovered fungi, only distantly related to other ascomycetes, which hitherto have been described only in terms of their DNA sequence (Schadt et al., 2003). DNA sequences attributed to this intriguing group have also been obtained from mycorrhizal pine roots (Rosling et al., 2003), suggesting that they are root-associated. Thus, almost all the fungi detected in the litter-humus after a few years of saprotrophic decomposition were recognised as, or presumed to be, mycorrhizal. In soil microcosms, we demonstrated antagonistic interactions between a saprotrophic basidiomycete and certain ectomycor-rhizal fungi (Lindahl et al., 1999). The outcome of the combative interactions was strongly affected by the amount of resources available to the saprotroph (Lindahl et al., 2001). Together these observations suggest that litter saprotrophs, when their cellulose supply is depleted, are out-competed by mycorrhizal fungi that have direct access to plant-derived photo-assimilates. The spatial separation of the two functional groups of fungi may simply reflect the fact that saprotrophs obtain their carbon predominantly from litter, deposited from above, whereas mycorrhizal fungi obtain their carbon from roots that enter the forest floor from below. Particularly noteworthy is the absence of sequences from typical 'soil fungi', such as Trichoderma and Penicillium, in the clone-libraries. According to conventional isolation-based studies, these genera usually dominate at later stages of litter decomposition (e.g. Widden and Parkinson, 1973; Soderstrom and Baath, 1978; Frankland, 1998; Virzo de Santo et al., 2002), and their absence in the DNA pool highlights the practical problems involved in isolating representative fungi from litter and soil. 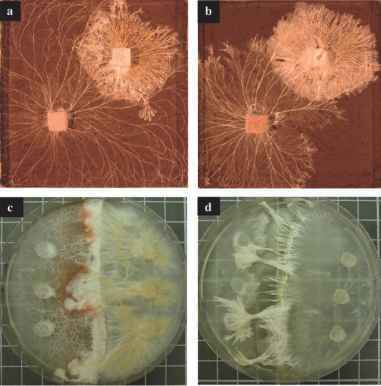 Most mycorrhizal fungi grow very slowly on agar plates, and many do not grow at all. When the dominant fungi in a sample fail to grow out on agar, opportunistic fungi, that initially constitute a very small fraction of the biomass in the sample or are present only as spores, may rapidly take over the agar plates. For example, Virzo de Santo et al. (2002) studied fungal colonisation of coniferous litter and observed dominance of basidiomycete mycelium on the litter from after 6 months and further throughout the entire 4-year experiment. However, when litter fragments were placed on malt agar plates, basidiomycetes were isolated only during the first 2 years, and were subsequently replaced by Trichoderma, Penicillium and Mucor species. These apparently conflicting observations are consistent with colonisation of well-decomposed litter primarily by slower growing mycorrhizal basidiomycetes, which escape detection using conventional isolation methods.